In elementary school, students learn that water freezes at 0 degrees Celsius (32 degrees Fahrenheit). That is true most of the time, but there are exceptions to the rule. For instance, water with very few impurities (such as dust or pollution particles, fungal spores, and bacteria) can be chilled to much cooler temperatures and still remain liquid—a process known as supercooling. Supercooling may sound exotic, but it occurs pretty routinely in Earth’s atmosphere. Altocumulus clouds, a common type of mid-altitude cloud, are mostly composed of water droplets supercooled to a temperature of about -15 degrees C. Altocumulus clouds with supercooled tops cover about 8 percent of Earth’s surface at any given time. 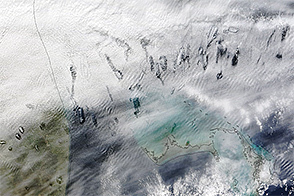 Supercooled water droplets play a key role in the formation of hole-punch and canal clouds, the distinctive clouds shown in this satellite image. 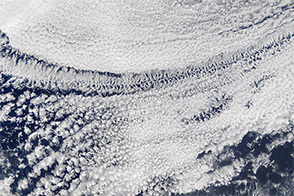 Hole-punch clouds, which are also called fallstreak clouds, usually appear as circular gaps in decks of altocumulus clouds; canal clouds look similar but the gaps are longer and thinner. 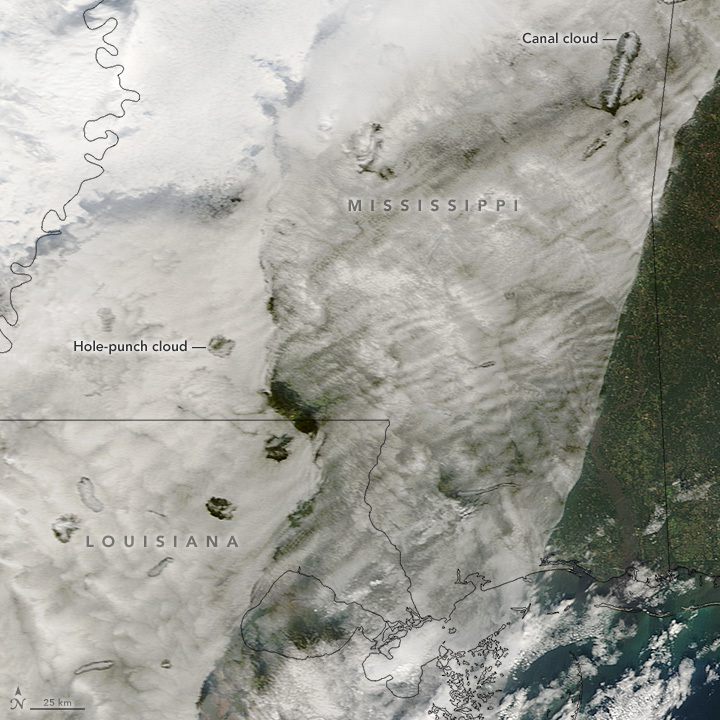 The natural-color image shows hole-punch and canal clouds over Mississippi and Louisiana, as observed on December 29, 2015, by the Moderate Resolution Imaging Spectroradiometer (MODIS) on NASA’s Terra satellite. Both types of cloud form when aircraft fly through cloud decks rich with supercooled water droplets and produce aerodynamic contrails. Air expands and cools as it moves around the wings and past the propeller, a process known as adiabatic cooling. Air temperatures over jet wings often cool by as much as 20 degrees Celsius, pushing supercooled water droplets to the point of freezing. As ice crystals form, they absorb nearby water droplets. Ice crystals are relatively heavy, so they tend to sink. This triggers tiny bursts of snow or rain that leave gaps in the cloud cover. Whether a cloud formation becomes a hole-punch or canal depends on the thickness of the cloud layer, the air temperature, and the degree of horizontal wind shear. Both descending and ascending aircraft—including jets and propeller planes—can trigger hole-punch and canal clouds. Read this post from the Capital Weather Gang at The Washington Post to see photographs of hole-punch clouds taken from the ground. Hole-punch and canal clouds form when aircraft pass through altocumulus clouds that are rich with supercooled water droplets. Bold Method (2014, June 6) How Contrails Form. Accessed December 30, 2015. Gierens, K (2014, June 6) Aircraft Induced Condensation. Accessed December 30, 2015. Heymsfield, A. et al. (2010, June) Aircraft-Induced Hole Punch and Canal Clouds: Inadvertent Cloud Seeding. Bulletin of the American Meteorological Society, 91 (6), 753-766. Heymsfield, A. et al. 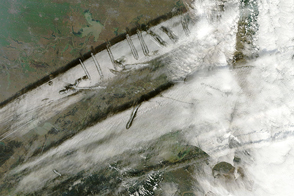 (2011, July 1) Formation and Spread of Aircraft-Induced Holes in Clouds. Science, 333 (6038), 77-81. National Center for Atmospheric Research (2010, November 7) Mysterious Clouds Produced When Aircraft Inadvertently Cause Rain or Snow. Accessed December 30, 2015. 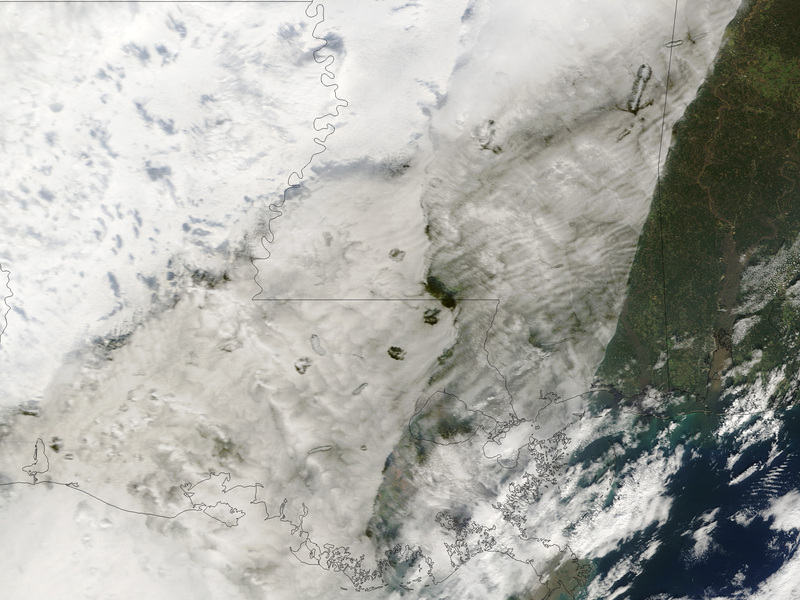 NASA Earth Observatory (2010, November 2) Hole Punch Clouds over West Virginia. The European Synchrotron (2014, November 14) Experimental explanation of supercooling : why water does not freeze in the clouds. Accessed December 30, 2015.